They like to lounge on my bed, especially when it is not made and is extra messy, or has laundered clothes all over it. 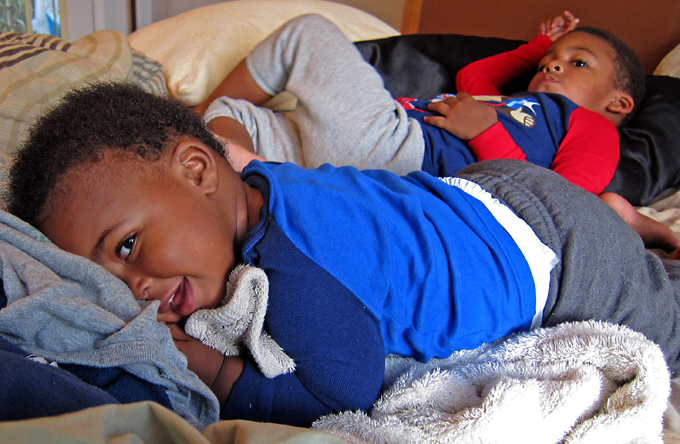 I guess rolling around in clothes while watching cartoons are their own little slice of heaven. In other news, we found a new babysitter for our date nights. Our usual sitter (hub's cousin) moved back to the Bahamas, so the future was not looking bright for us. Just in time, a friend recommended a sitter she knew who just recently moved to our area. She's a full time nanny, who picks up extra babysitting cash on the weekends. We have a date night scheduled for tomorrow. It is much needed! Hope you all have a super-duper weekend! I have some product reviews to be posted soon too. So, be on the lookout! Super cute! (my little one thought the pic of your baby was him, lol) That's great you have a new babysitter. For years the lack of one prevented us from even having a date night ...forever. Now that I'm back around family I get out whenever I want. I love the babies and my almost 15 month old does the same thing! Oh yeah, can't wait for the product review! I love the idea of finding a sitter. We worked something out with my friend so we alternate 2 weekends a month watching each other's kids. Thank goodness we have easy kids that play well.